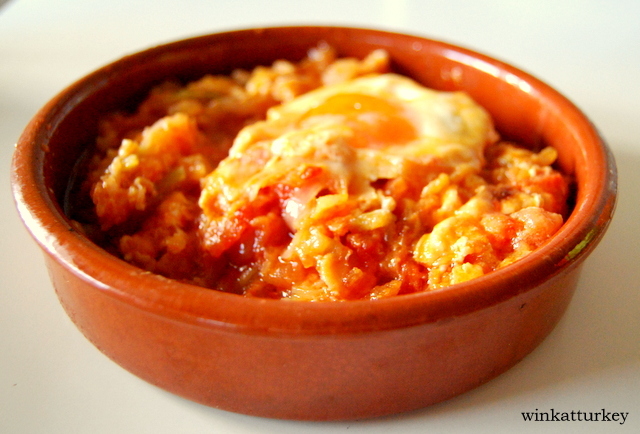 The menemen is a popular dish in Turkey, you can find in many restaurants offering Kahvaltı (Turkish breakfast). It is a very simple and very complete dish that can be enjoyed at any time of day. – 3 or 4 green peppers. – 1 egg per person. Chop the peppers into thin slices. Peel the tomatoes and chop into small pieces. In a skillet with a little oil we sautéing onions and peppers, over low heat until golden. Add the tomatoes to the pan and threw salt to taste. Cook over low heat until the tomatoes are tender, about 10-15 minutes approx. In the last minutes cascamos eggs and threw the pan, let it curdle and just before removing from the fire we can add grated cheese on top (this is optional). You can cook vegetables in a pan and then pass some clay pots, you'll get al oven. In each base we already cooked vegetables, each add an egg casserole and introduce the oven at 180 º C until the eggs are set. In this way we can serve it in individual portions.